Hanoi (VNA) - In addition to infrastructure facilities to serve operations of reporters coming to cover the DPRK-USA Hanoi Summit Vietnam, the International Media Centre (IMC) has provided them with free lunches and dinners, making it a chance to promote the hospitality of Vietnamese people and traditional dishes. At lunchtime right after the IMC was opened for reporters on February 26, the food court attracted a crowd of foreign and domestic reporters. A wide range of European and Asian foods, including Vietnamese dishes such as ‘gio’ (pork-pie), ‘cha’ grilled chopped meat, ‘banh cuon’ (steamed rolled rice pancake), ‘nem ran’ (fried meat rolls) and cakes, were served at the buffet lunch. In particular, Hanoi city’s food court saw the participation of many cuisine artisans coming from restaurants and century-old craft villages, offering ‘Pho thin’ (Thin noodles served with beef), ‘bun cha’ (noodles and grilled meat), ‘bun thang’ (noodles in chicken broth), ‘xoi Phu Thuong’ (steamed glutinous rice) and ‘banh khuc’(cake made of glutinous rice mixed with everlasting gnaphalium leaves. 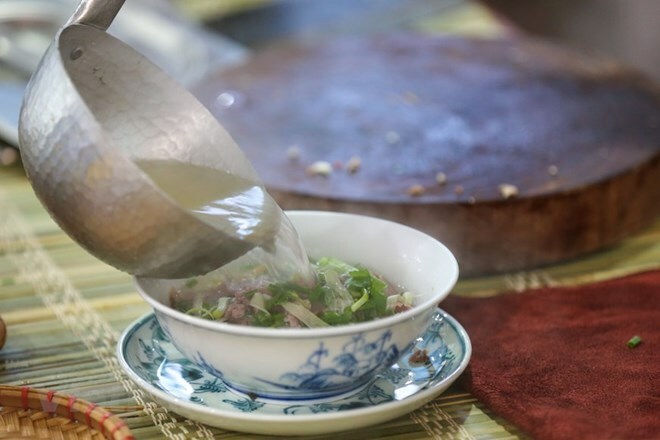 Nguyen Thi Tuyen, an artisan from Phu Thuong steamed glutinous rice village, said: “Foreign reporters liked the Phu Thuong steamed glutinous rice very much. Despite language difference, their happy eyes, friendly smiles and repeated nods showed that they enjoyed the food. 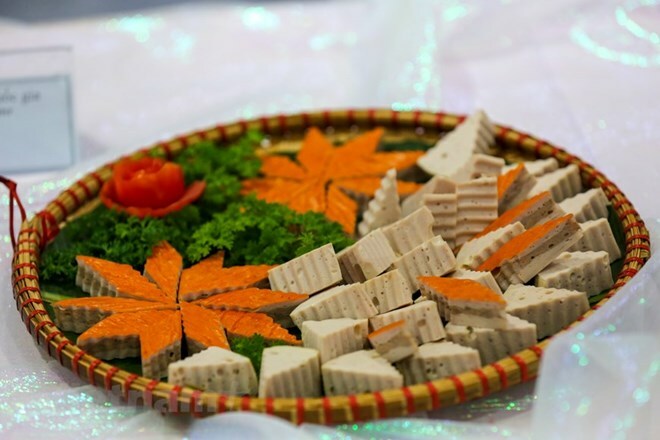 Tuyen said she and her villagers were very happy when the city’s authorities invited them to serve at the IMC because they would have a chance to introduce the Phu Thuong steamed glutinous rice to international friends coming from all parts of the world. Being proud to serve ‘bun thang’ (noodles in chicken broth) at an important external event for the first time, Doan Van Nai – a third generation descendant of Ba Am Bun Thang Restaurant at 37 Cua Nam, Hanoi, said the brand of Ba Am ‘bun thang’ appeared in the city more than 100 years ago. Nai hoped that the serving of ‘bun thang’ at the IMC would contribute to the success of the DPRK-USA Summit and promote Hanoi’s traditional unique dish to international friends. Having been in Vietnam for the first time, Lee Paai Fung, a reporter of Hong Kong-based Ta Kung Wen Wei Media Group, said he has heard about well-known Hanoi ‘pho’ – the favourite dish of many people. Therefore, Lee decided to try ‘Thin pho’ and he was very pleased with his choice. Lee said he would taste all traditional dishes of Vietnam while working at the IMC and by doing that he would learn about further the Southeast Asian nation’s culture. Highly appreciating the conditions for the journalists’ work at the IMC, Alberto Salazar, correspondent of the Hanoi–based Prensa Latina News Agency said the food serving journalists are very good and this is a chance for many international journalists who come to Vietnam for the first time can taste its traditional dishes. “It’s a good idea to help international media know about Vietnam through local food,” Kamonrat Wichiankoo from AFP said after finish his first meal at the IMC on February 26. He is also impressed with the diverse variety of foods and drinks served for free for the journalists. Nguyen Quoc Hung, Deputy Director of the National Convention Centre who is in charge of the food court at the IMC, said the IMC serving the DPRK-USA Summit has differences as compared to those at big international events hosted by Vietnam. This time, the IMC is much larger with the higher number of reporters, he said. Senior leaders of the government and Hanoi have also paid great attention to the logistic work, including the provision of free lunches and dinners for reporters at the IMC, he said. To serve a large number of reporters, the IMC has made careful preparations in selecting material suppliers, ensuring food safety and hygiene and inviting cuisine artisans, Hung stressed.